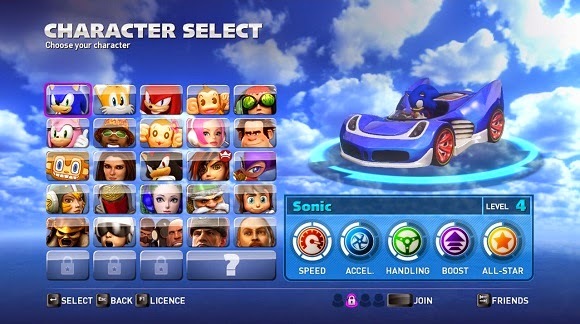 Sonic & All-Stars Racing Transformed is good. Dang good. Maybe not quite better than Mario Kart 8 overall - its name is way too long for one thing - but it still does a bunch of stuff better than Mario Kart. It makes me wonder if the developers of recent Mario Kart games are just slacking because they know you'll buy the games anyway... Well, in any case, let me tell you some cool stuff about Sonic & Blahblah Transformed, counting down to what I consider to be the biggest and best things. In Mario Kart, there's no one place to go to marvel at all your achievements. That's not a huge deal. What's a bigger deal is that there's no way to show off your achievements publicly next to your name when playing online as you can in Racing Transformed. You can't even have stars next to your name in Mario Kart 8 any more for beating all the grand prix with star rank or higher. In Racing Transformed, not only are there unlockable stickers for doing obvious things like winning a grand prix, beating staff ghosts, and progressing through World Tour, there are also fun achievements for stuff like passing a certain number of people in a single drift or having a certain accuracy percentage with attack items. Out of all the stickers unlocked, you can pick three to put on your license, which will show next to your name while waiting in online lobbies. Also, you can view any other player's license and statistics in more detail at this time as well. It sure would be nice if Mario Kart let you do that. Note that I played on the Steam version and that characters vary between versions. In Mario Kart, you'd better be sure you picked the vehicle you want when playing online, because you won't be able to change it again without leaving the lobby. This is in spite of the fact that, in an interview somewhere I can't find any more, one of the developers of Mario Kart 8 acknowledged that different vehicles have the advantage on different types of tracks. That's to be expected. So why can't you change your vehicle in between races? Well, you can in Racing Transformed. After the next track is selected, there's a bit of time for you to strategically change to a vehicle suited for that track. Differences are usually much greater than a floating island getting blown up, but harder to show in screenshots. Does this happen in Mario Kart? I don't think so. 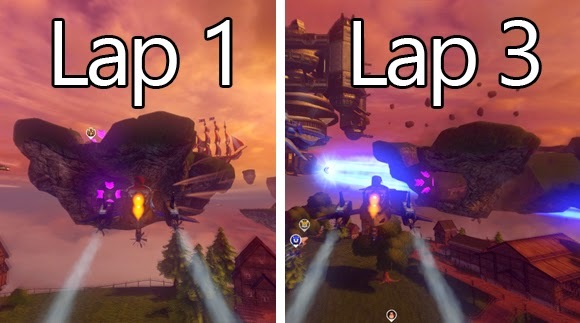 Except in Grumble Volcano (Wii) where the ground falls away throughout the race and in that one homebrew course, tracks rarely change at all throughout the race. In Racing Transformed, on the other hand, pretty much every track changes between laps. 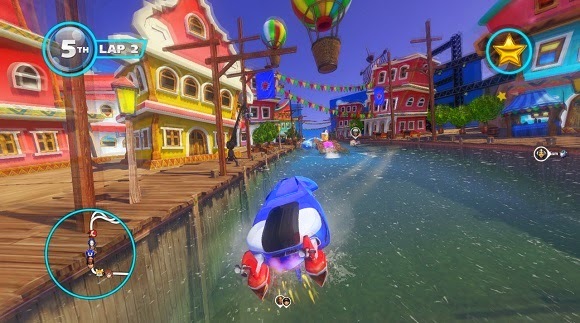 Usually this makes use of the game's transforming gimmick by having parts of the track be destroyed or rerouted so that you're forced into boat or plane mode. It's not hugely necessary, but the dynamic nature of all the tracks certainly makes them more interesting and is a fun twist. It may be hard to tell in this screenshot, but I'm flipping out right now. The tricks introduced in Mario Kart Wii are dumb. The reason why is that they're essentially guaranteed speed boosts that require no skill whatsoever. All you need is the knowledge that a trick can be performed at that particular place and the press / mash of a button. It's a freebie. There may as well be a boost pad at those trick points because it'd be just as easy to get the boost. But, in Racing Transformed, doing tricks for boosts actually requires a bit of skill. Instead of pushing a button for an instant, unfailable trick after every jump, tricks can be performed anywhere you can get air. Not only that, but you can do front flips and back flips and more than one at a time for greater boosts upon landing. That means that you have to judge how many flips you can fit in before landing and need to time them to be not too early or too late. This way of handling tricks is more skill-based and more fun - much better than Mario Kart's mindless button presses. One of my biggest complaints about the Mario Kart series is the games' lack of single player content. You always get grand prix and time trials and that's it. I thought we were making progress with Mario Kart DS's Mission Mode, but then that was gone in every future sequel. Laziness! That's what this is! 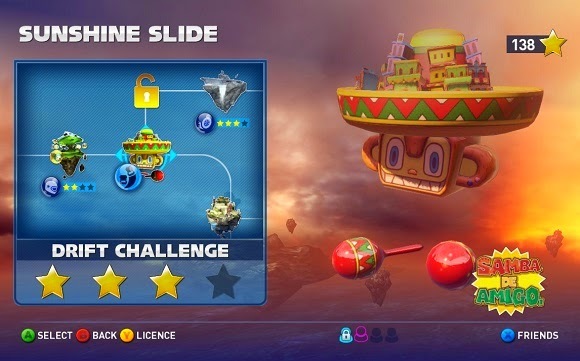 Thank goodness Sonic & All-Stars Racing Transformed has this covered with a buttload of fun different challenges on each of the tracks, each with four different difficulties to attempt (not to mention the sticker achievements mentioned earlier). These aren't just races. There are drifting challenges, where you have to try to drift within a certain area to keep the clock from counting down, there are traffic avoiding challenges, boost pad hitting challenges, deathmatch challenges, tank boss destroying challenges, and more. 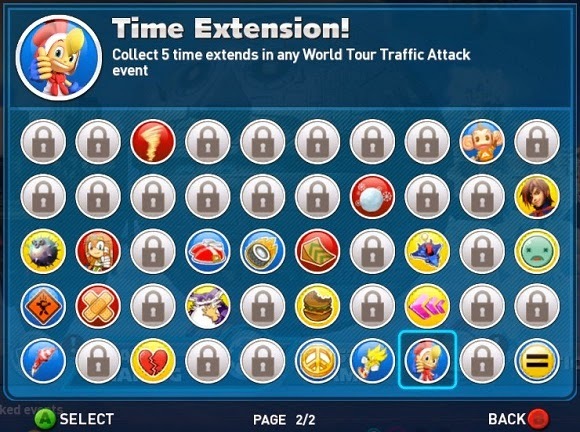 Winning on harder difficulties nets you more stars, which let you progress through this World Tour mode and unlock new vehicle mods and characters. This mode offers a range of challenge and makes unlocking things more satisfying and fun. Grand Prix and Time Trials are still there, of course, but World Tour is far better suited for a single player experience. Mario Kart's Grand Prix: a monotonous character/track-unlocking prerequisite. Racing Transformed's World Tour: a mode that uses existing tracks in new ways and offers a fun break from online multiplayer that you'll actually want to play. Let's hope that Mario Kart gets with the program and starts doing more than simply being a bunch of new tracks with each game. Agree? Don't? Let me know in the comments!